What's Jason Voorhees favorite desert? How do martians eat their ice creams in space? What is the best food to eat when you're scared? Where do reindeer go for ice cream? Banana split. Its the word banana, and its split apart. 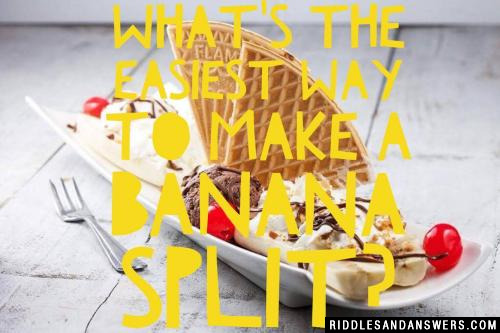 What's the easiest way to make a banana split? 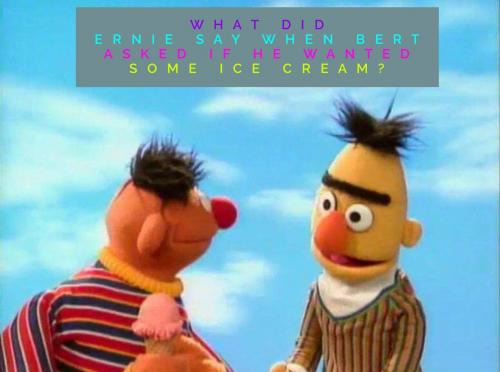 What did Ernie say when Bert asked if he wanted some ice cream? What is a Jews favorite ice cream flavor? Where is the best place to get an ice cream? What do vegan zombies like in their ice cream? Can you come up with a cool, funny or clever Ice Cream Riddles of your own? Post it below (without the answer) to see if you can stump our users.